The Vancouver Condo Buzz » NEW LAUNCH! FULTON HOUSE Burnaby Brentwood Condos by Polygon! « Landmark Burnaby Condo Tower > TRIOMPHE Brentwood Condos for Sale with Awesome Amenities! NEW LAUNCH! FULTON HOUSE Burnaby Brentwood Condos by Polygon! 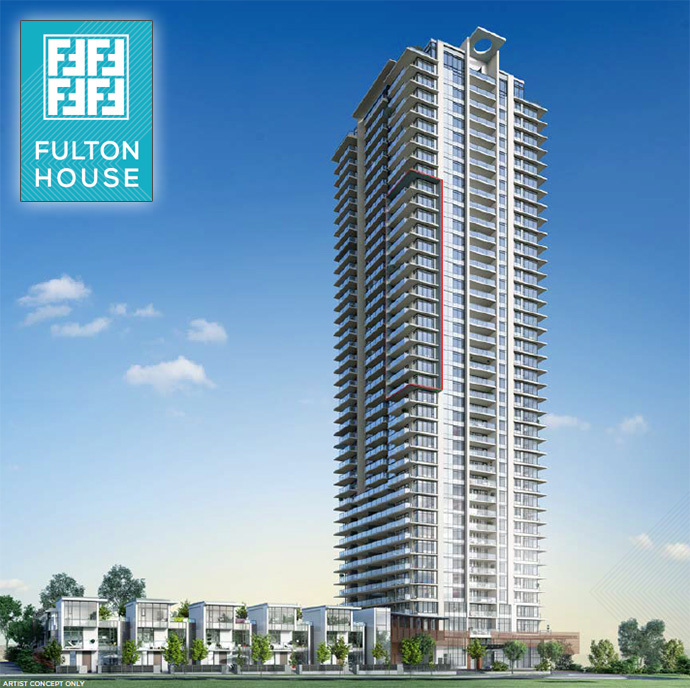 One of the most exciting new Brentwood Burnaby condo towers is called Fulton House by Polygon. Designed by acclaimed architect Buttjes Architecture, the Burnaby Fulton House condos is a striking addition to one of the most exciting city skylines in the Lower Mainland with its modern silhouette and iconic glowing LED features. Set back from a tree lined street, the Fulton House Burnaby presale condos boast an impressive arrival area featuring professional landscaped grounds, and a dramatic glass entry canopy to welcome you home as well as your guests. Custom metal and glass doors open into a hotel inspired entry lobby with a luxurious seating area to welcome your visitors or for you to wait for your ride. The new Burnaby Fulton House Brentwood Condos is all about prime location that is just a short walk away from the revitalized Brentwood Town Centre as well as the SkyTrain network that will get you everywhere in the Lower Mainland. In addition, just a few steps from your front door are numerous shops, big box retailers, local transit routes, services and amenities. Offering immediate and convenient access to a wide variety of amenities, the new Fulton House Burnaby condo tower is located in the burgeoning Brentwood real estate district that is seeing enormous transformation and redevelopment. Brought to you by Polygon Fulton House Brentwood condos are within walking distance to the new Whole Foods Market, shops and services at Brentwood Mall in addition to great proximity to major transit routes including the SkyTrain, biking lanes and much more. The master planned residential community will feature 303 one and two bedroom condos and will feature exclusive clubhouse amenities at the resort inspired Fulton Club that includes a swimming pool, hot tub, double height fitness centre, dedicated yoga studio and much more. Visit www.polyhomes.com for more info or you can register on this page for the latest updates. The Fulton Club is one of the most amazing perks for living at the new Burnaby Fulton House condo tower. 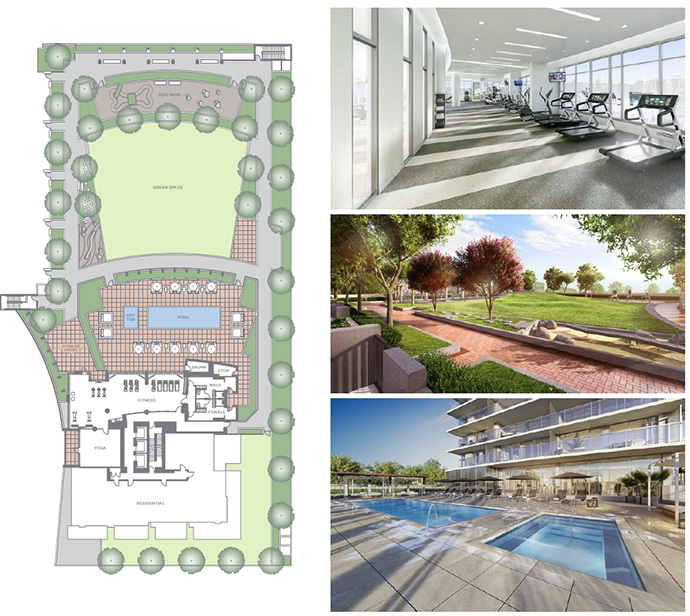 Featuring over 28,000 square feet of indoor and outdoor fitness retreat space, the Fulton Club offers residents a series of health enhancing amenity spaces that includes impressive social club spaces that are great for hosting small to large gatherings in addition to watching movies or sports events. In addition, there is a landscaped terrace deck with an outdoor exercise zone, a children’s play area as well as a dog friendly area for those who have pets. The Fulton Club at The Fulton House Burnaby condos will have an outdoor patio with swimming pool, hot tub as well as lounge seating in addition to a resort style fitness club with cardio equipment as well as weight training equipment. There’s even a dedicated yoga studio. Some of the other on-site amenities at the Fulton House Brentwood condos include a dog grooming station, lots of visitor parking, four car wash bays provided in the secure underground parkade and multiple electric car plug in stations. There is an on-site resident manager in addition to hard wired smoke detectors and key fob access to parkade and common areas. In addition, there are security proximity readers, digital recording cameras in the parkade and lobby and an elevator lock-off for restricted floor access for added security. All homes come with the Comprehensive Travelers Canada Home Warranty coverage of 2/5/10 years. Bike lockers for outdoor gear are available for purchase upon request. The homes at this newest tower addition to the Brentwood real estate market features amazing interior finishes that start with a contemporary solid wood front door with polished chrome hardware. Interior doors are two paneled Carrera-style and there are three designer selected colour schemes that are called Mocha, Earl Grey and Vanilla. In addition, there are expansive low E windows an stylish vertical blinds. Warm wood style laminate floors throughout the main living spaces are durable and easy to clean and maintain and the bedrooms have white plush carpets. Most main living areas will have 8’6” ceiling heights in most homes. The gourmet kitchens at the Polygon Fulton House condos in Brentwood features a quality appliance package that includes a stylish fridge with bottom mount freezer that is integrated into the custom cabinetry (24” fridge for 1 bedroom layouts and 30” fridge for 2 bedroom homes). There are 30” wide five burner gas cooktop and self cleaning wall oven in addition to top mounted control Energy Star rated dishwasher that is integrated with cabinetry in addition to a microwave that is built in as well. 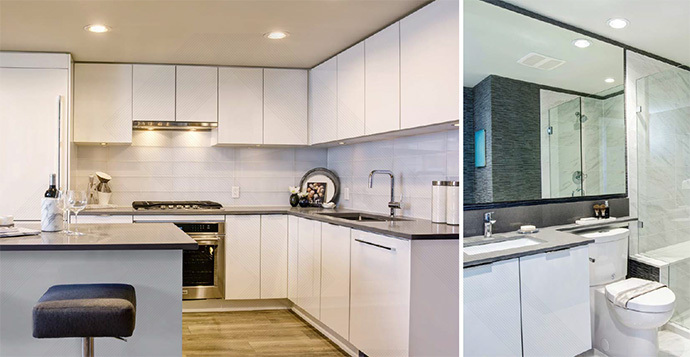 The Fulton House Burnaby condos for sale will feature sleek , elegant flat panel custom cabinetry in addition to a convenient kitchen island in most homes for additional work space. There are under mount double sink in stainless steel finish as well as a sophisticated single lever faucet with telescopic vegetable spray. Recessed under cabinetry lighting as well as smart, modern design elements such as a built in recycling station, soft close cabinetry hardware and polished chrome pulls on lower cabinets are some other things to look forward to. Most homes come with side-by-side washer and dryer in addition to all homes have TV outlets and telephone jacks located just where you want them. The designer bathrooms at the Brentwood Fulton House condos in Burnaby will feature a master ensuite with rich designer details that include flat panel cabinetry, oversized vanity mirror, recessed lighting and contemporary under mounted sinks. The luxurious oversized spa (in most homes) features frameless glass door, a rain shower head with handheld wand as well as a built in niche for toiletries and integrated bench seating. There is a linen closet in most layouts and the second bathrooms have modern rectangular soaker tub with polished chrome fixtures and all bathrooms have stone (engineered) counters and backsplashes, porcelain tiled floors and floating flat panel custom cabinetry with polished chrome pulls and soft close hardware. There are dual flush toilets as well. Special Fulton House Penthouse unit features include upgraded suite entry and common area corridor, air conditioning for year round comfort, gas BBQ hookup on the balcony and ceilings up to nine feet high in the main living areas. In addition, the penthouses at Fulton House Brentwood feature a wine fridge and an upgraded appliance packaging featuring a 36” fridge.